All ambitious but heartbroken wedding planner Sophia cares about is her fiance Michael, who apparently just dumped her. Neither the high profile wedding of aging silent movie legend Angelyne Argyle nor the nomination for the Wedding Planner of the Year Awards help to brighten up her day, when all of a sudden she finds herself surrounded by vampires plotting to take over the world. With the help of photographer Paula and florist Raymond, Sophia jumps to rescue her fiance, to ruin Angelyne’s evil plan and to save the world from impending doom. With cover art by illustrator Franke, who has worked on projects all over the world, and comic pages by DC/Marvel comic artist Eduardo Baretto, Vampire Wedding not only excels in original storytelling, but provides the incredible level of visual quality you’d expect from any major comic or graphic novel. As if that wasn’t enough, the creators of Vampire Wedding are giving their fans an unprecedented opportunity to be a part of the upcoming film, beginning with one simple question: Do you have what it takes to be a vampire? DarkMedia had the pleasure of sitting down with Robert to talk about what a vampire is (and isn’t), what’s coming up next for the Vampire Wedding franchise, and his picks for an A-list dream cast. It isn’t often you hear the description “romantic horror comedy” in general, and especially when it comes to vampires. Can you tell us a little about how the idea for Vampire Wedding came about? In 2002 I wrote two short stories, one about a murder scene at a wedding, a runaway bride on a killing spree, and the other one about a wedding photographer who finds herself caught in a web of mysterious incidents. Both these ideas I took in 2007 and combined them, adding a former silent movie star, soon noticing that vampires will be the next big thing. I thought it would be interesting to add the vampire genre to a mystery story about a wedding planner, and turning it into a romantic horror comedy. Aside from the website, you have a strong, successful presence on so many social media outlets (Twitter, Facebook, Tumblr, etc.). What’s the secret of your success? Surprisingly, it proved quite tricky to get exposure on the internet in the first place. The old school route of publishing content and hoping that your audience will spread the good news by word of mouth online did not work at all. I think the secret to success and exposure online is to turn your audience into publishers too. As soon as we started the global vampire casting campaign, people started uploading headshots and our online fanbase grew so fast, that we couldn’t keep up with answering participant’s emails and postings in the beginning. Fortunately we have several very dedicated people working the social media channels for Vampire Wedding. From page to screen, Vampire Wedding is soon to be a feature film. Was that always the plan, or did the scope of the project evolve? Can you tell us more about the film and casting promotions? The movie came first. The screenplay was in it’s fourth draft when we decided to turn it into a comic mini series. We want for potential investors to see right away what the story is about. It has the advantage of us being able to test the story and concept before investors have to pour millions into a film that might never make its money back. The success of our ongoing casting campaign and the ever growing following of Vampire Wedding, proves that we are on the right track. You’re often asking your fans about their perception of what a vampire should be, through various polls and interviews. What’s the most popular response? What’s your own answer? Most of our fans agree that real vampires shouldn’t sparkle as the ones in the Twilight series of novels and films. About half of our fans think that real vampires should look more like the classic Dracula type, while the other half is convinced that real vampires are no different than your average Joe (or Josephine). My take is that in real life there are very few people who are actually born with sharp fangs, turn into bats or feel comfy sleeping in a coffin, but certain archetypical vampirish character traits do exist in all of us, even if just on a psychological level. I mean at the end of the day being a vampire is all about revealing the animal in us. Congratulations on launching the first iPhone app to ever be used for casting purposes! How does it work, and what can people expect when they download it? You can download the iPhone app from the Apple AppStore here. As soon as you install it, it lets you read about Vampire Wedding the comic and film, take pictures of your or your friends dressed as vampires, save them in a photo gallery, or upload them directly to your Facebook profile from where you can share it with our Facebook wall. 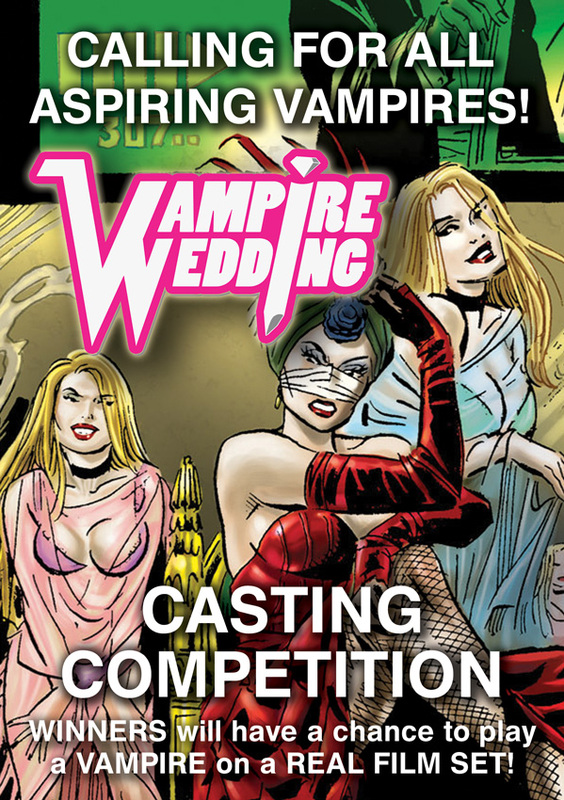 Optionally you can also email your headshot entry (casting@vampireweddingmovie.com). The app also gives you brief character descriptions on all of Vampire Wedding’s main characters as well as short bios about the creators. And because of our signature artist’s (DC and Marvel legend Eduardo Barreto) brilliant artwork it also looks gorgeous. Your concept for a worldwide virtual casting call is brilliant, if not unprecedented in the industry. How has it been so far? Is it everything you expected it would be? Do you hope to revolutionize the future of independent film casting by establishing this as a truly successful and viable alternative to the way it’s traditionally done? We received a lot of headshots from people who must have felt they visually resemble a specific character in Vampire Wedding, all just based on the sample artwork and character samples we’ve released so far. It is amazing when you set out to hunt for cast and instead of you running after them, the right types knock on your door. It almost feels like magic. Remember when Selznick began a nationwide casting call that interviewed 1,400 unknowns for the role of Scarlett in Gone with the Wind? It feels the process is the same, but much simpler for everyone and much more powerful than ever with nowadays technology. If you had the opportunity to cast Vampire Wedding with all A-List celebrities, would you? What’s your dream cast? Perhaps Zoey Deschanel for the lead role of vampire slaying wedding planner Sophia, Zoey is quirky, cute, a fantastic comedienne, and even looks very much like our Sophia. For Sophia’s boyfriend ‘damsel in distress character’ Michael I can see Casey Affleck. And for the antagonist role of silent movie star turned vampire queen Angelyne Argyle we’d love to have Sigourney Weaver or Meryl Streep. What’s next for Vampire Wedding? What do your fans have to look forward to as you continue with the casting competition? Over the next few months, we plan to extend the casting campaign into a global video casting competition for the speaking roles. Aspiring actors will get the chance to download a screen-test script for the part they want to audition for, tape the audition on their mobile phone or web cam and upload the video to our casting web site, where visitors can comment on and vote. Ultimately, Castalides Pictures will pick the talent from the online casting site and the participants with the most likes will receive special attention. I believe that a collective audience has a right to decide on what and who they want to see. At the end of the day it’s the audience who pays for the movie tickets, not the studio executives or casting agents. Enter your email address to subscribe, and receive notifications of new posts by email. Do you like it Dark?